Relentlessly Fun, Deceptively Educational: It's Snowing Angles! 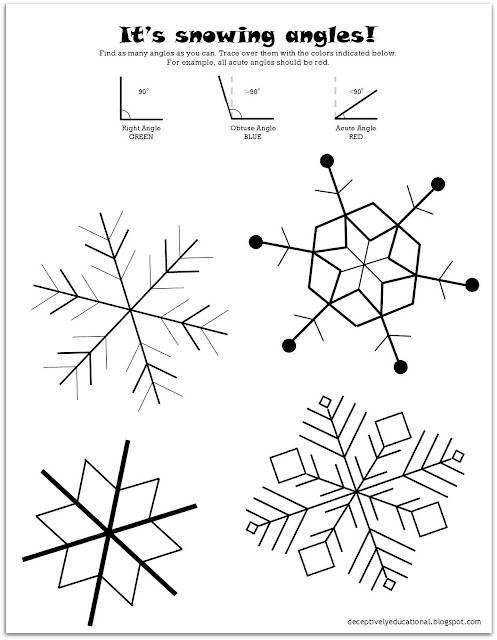 Have you ever looked at a snowflake? 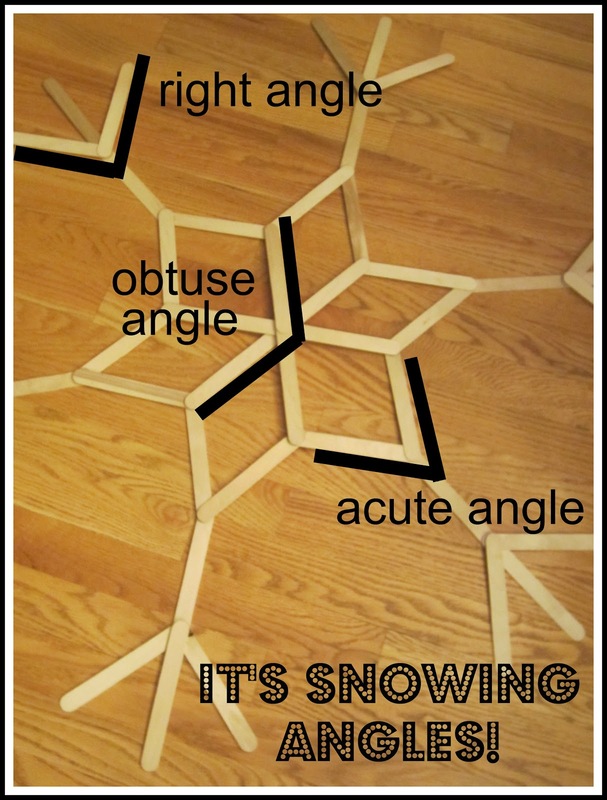 It's made up of a TON of angles! While we have yet to see a flurry of white flakes falling where we live, that doesn't mean that a little winter weather-inspired math practice wasn't in order. My son has learned right angles at school but that's it. I figured we could step it up a notch. I gave him a protractor and watched for curiosity to sweep across his face. Then I explained that right angles are 90 degrees, obtuse angles are greater than 90 degrees, and acute angles are less than 90 degrees. I showed him how to line up the bottom of his protractor to tell the size of an angle. Now, I handed him red, blue, and green markers and a page with four snowflakes. Download a free 1-page PDF of this worksheet here. Time to find and color the three different kind of angles. This took some practice and even though it was hard, I knew it was a success when my son said, "You know, this is kind of fun!" 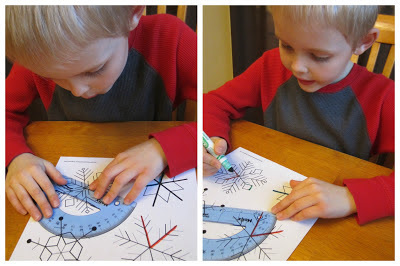 When he grew tired of coloring angles, I got out a package of jumbo popsicle sticks and told him it was time for us to make a snowflake. 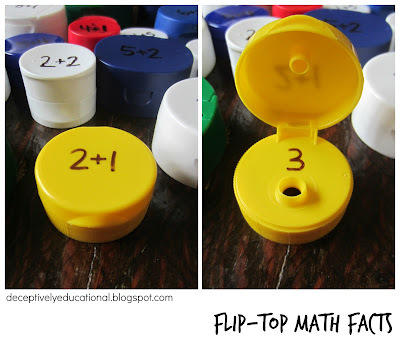 This amazing math craft is the sheer genius of Peggy Banks over at DIY Crafty Projects. 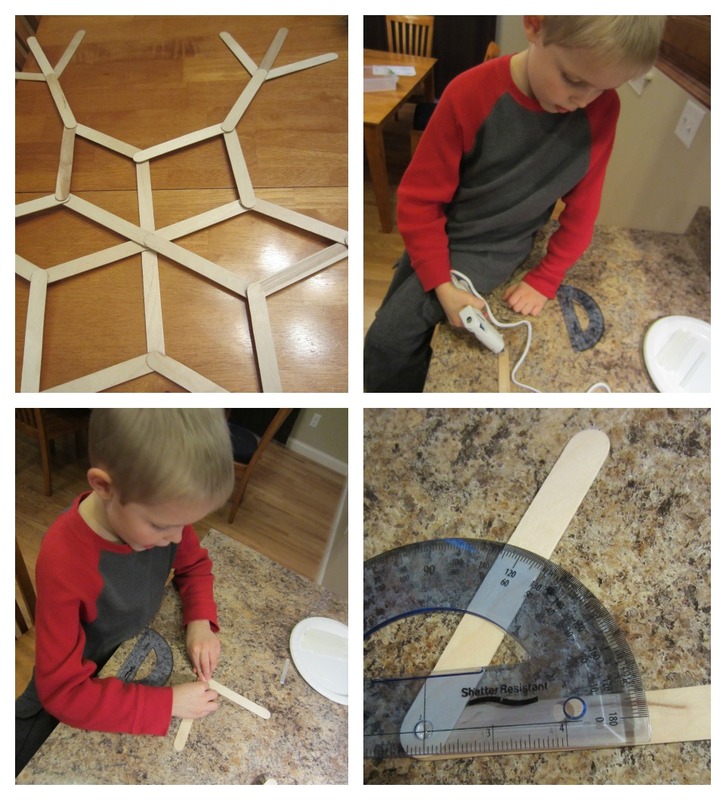 With a low-temp glue gun and the protractor in hand, we gradually glued together the sticks to form a giant wooden snowflake. During its construction, I asked loads of questions to get him thinking (e.g. "So is that an ACUTE angle or a RIGHT angle?"). Peggy's instructions at DIY Crafty Projects are amazing. 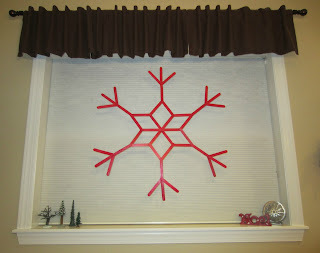 Follow her tutorial here; she shows you step-by-step how to make several different shaped snowflakes. Once it our snowflake was complete, I sprayed it with red spray paint and red glitter spray; then when it was dry, hung it in the window with fishing line. Not only is this a beautiful addition to our holiday decor, but it's a month-long reminder of our afterschool angles lesson! Now that's what I call a real win-win. I love this! What a great way to combine a seasonal activity with a math lesson! LOVE this! I can't wait to try it out. Thanks for linking up to Share It Saturday! I am sharing this post on my facebook page. What a great project. I love that it incorporates learning! This is a wonderful idea, and they look fabulous! I think that even my tween would enjoy this idea. Thank you so much for the printable and the idea. My school is using this as an activity for our Family Science Night. The theme this year is S.T.E.A.M. We're excited to do this activity! I absolutely love the idea! Is it ok if I translate it in french and post it on a teachers group with your name on it (of course)? ?